Looking south from Hastings St. presents a view of construction between Hwy 196 and Michigan St. hill, commonly known as the Medical Mile. The Towers building fronting Michigan St. is at the far left, and to its right is part of the Spectrum Butterworth campus. 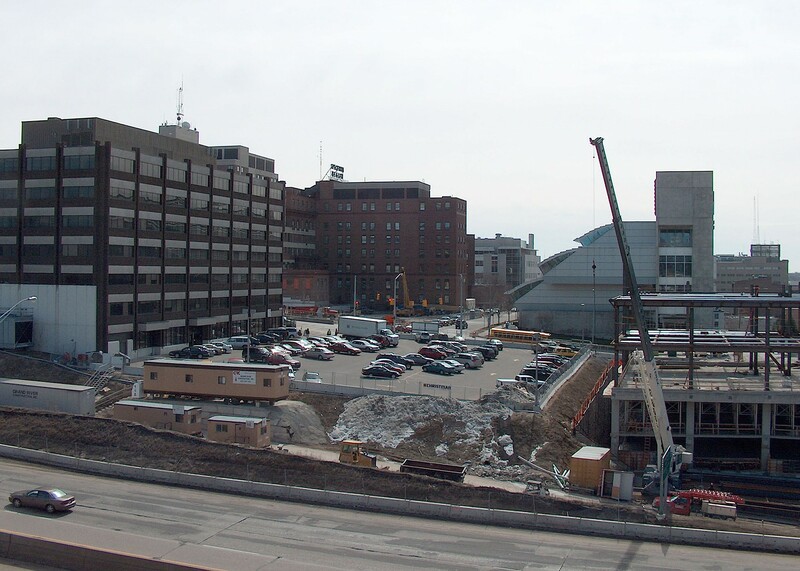 Farther right is the modern structure of the Van Andel Institute. The building under construction at the far right may be the Spectrum Health Research Dept. A large crane and several construction trailers stand at the edge of the highway. A large parking lot occupies the center of the photo. Title by cataloger. The Towers Building has been demolished to make room for newer buildings.